I have recently discovered the most wonderful blog -- La tartine gourmande by Bea. Bea's photography is so seductive that it completely ruined my productivity at work one afternoon. Her cooking style defies description -- it's rustic one day and contemporary another, but one theme that runs through all her recipes is that they all look like fun. Looking through her blog over the past couple of weeks, I must have thought a dozen times "Wouldn't this be fun to make!" Since Bea's first language is French, and New Zealand pops up a lot in her writing, I expected her to be somewhere far, far away. So imagine my surprise when she turned out to live 10 minutes away from me. Of course reading blogs from far and exotic places is cool and all, but I still can't help but get excited when I learn about a new food blogger in Boston. Hey, we must be cooking with the same veggies, going to the same bakeries, and fishmongers! I wonder if Bea likes Russo's, New Deal, Formaggio's, Iggy's and Clear Flour? Yesterday, I actually got to try one of Bea's recipes. Excited by the lovely weather we had over the weekend I got some veggies for the grill, but by the time I got around to cooking them, it was cold enough to snow (that's the spring weather for you in Boston). Since grilling was not going to happen, I was trying to think of a more homey dish to make out of red snapper and zucchini, and Bea's dish of trout with veggie ribbons immediately popped into my head. I didn't have the recipe on hand, and was not in the mood to follow instructions, but I remembered that it involved paper thin veggie ribbons made with a peeler, a fish, and a cast iron pan. Since I had all 3 essential ingredients, I set to work. 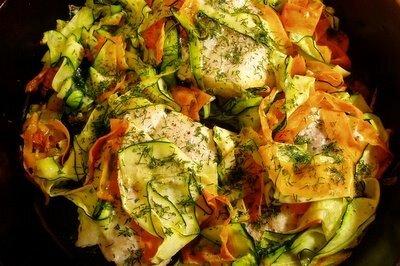 I seared the fish, then piled on zucchini and carrot ribbons, dotted with butter and baked in the oven until the fish was done. The snapper soaked up the veggie juices and came out wonderfully moist, and the veggies were delicate and sweet. I liked the dish so much, I tried it again tonight with halibut and yellow squash. This veggie ribbon idea has great potential -- I'll have to experiment with it more. Thanks for a great meal, Bea! Cut zucchini in half lengthwise and shave zucchini and carrots into ribbons with a peeler. Put in a bowl and set aside. Dry fish well on paper towels and generously season with salt and pepper on both sides. Set a large oven-proof non-stick or cast iron skillet over high heat. Add 1 Tbsp of butter. When butter is melted, add the fish skin side down and cook without disturbing until browned, 2-3 minutes. If using fish without skin, flip it over. If using fish with skin, don't flip it so that the veggies don't make the skin soggy. Drizzle veggie ribbons with 1/2 Tbsp olive oil, sprinkle with salt and pepper and pile on top of the fish. Place the pan in the middle of the oven for 8 minutes per inch of thickness of the fish. 2 minutes before the estimated cooking time, top each fillet with 1/4 Tbsp butter. To check for doneness, separate the flakes with a fork. Fish is done if the flakes separate without much resistance even if some parts still look translucent. Spinkle with dill and serve. Thanks for your sweet post. I feel flattered. But I also feel reciprocal in regards to your great, informational blog, full of lovely recipes. And as you said, so nice yo be close by! I actually want to know where you get your fish since I do not always find what I need. Do you go close to Fresh Pond, to this fishmonger? As to the others, I am close to Russo's, love Hi Rise, and Formaggio's and Savenors. Also a new butcher place in Newton. Clear Flour yes. I heard of a new bakery as well...ahahah, you and I need to meet to share our resources!! She has a recent recipe, which I'm anxious to try and I'll be putting this one on my list, too. Red snapper/trout, zucchini, carrots? Yum! My kind of meal! I love that you always put fish substitutes. Thanks!